It’s hard to believe that January is over. Seems like the New Year’s Eve countdown was just a few nights ago. After a quiet January on the talks/readings front, there are two gigs planned in February. 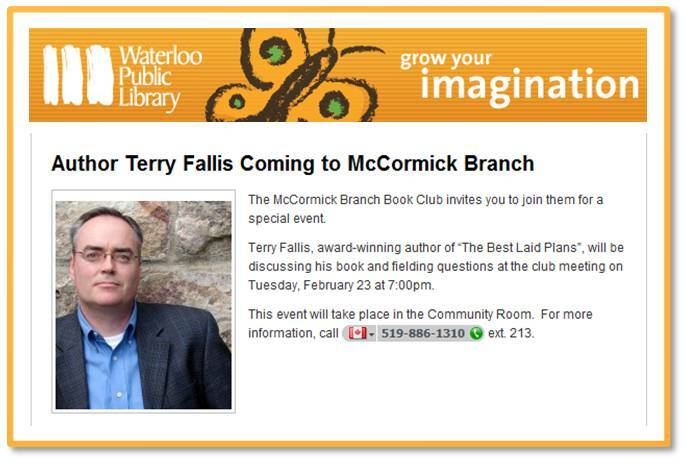 (I’d love to see you there if you’re in the neighbourhood.) Then events pick up again in May and June. You can see my schedule, such as it is, on the Appearances page. In the last couple of years, I’ve really enjoyed the time I’ve spent in Orillia at various Leacock-related events, and getting to know the folks at the Leacock Association who do so much to breathe life into the great Canadian humourist’s legacy. 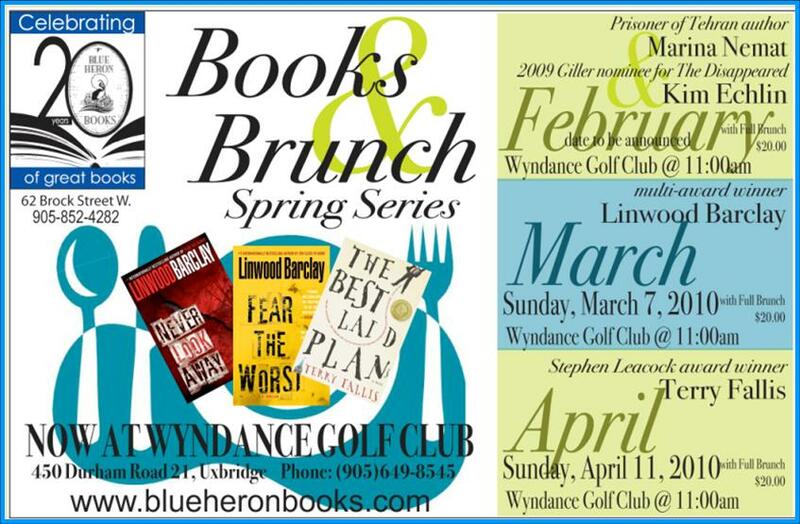 I’ve been to two Leacock luncheons, one Friday night soiree, two Leacock Galas, a couple of great parties, the Leacock Summer Festival, and even a local book club meeting. I’ve also had a piece run in the Orillia Packet & Times. I’ve enjoyed them all. I was already planning to attend this year’s luncheon and gala but it seems I’ll now have some additional responsibilities. I was thrilled some months ago to get a call from outgoing Leacock Association President, Wayne Scott, inviting me to serve as Master of Ceremonies for the 2010 Leacock Gala (!) on June 12th, on the shores of Lake Couchiching. I’m excited and nervous at the same time. You see, I have big shoes to fill. Last year, the hilarious and talented writer, Drew Hayden Taylor, ran the show.Â And the year before that, the amazing satirical songwriter, Nancy White, was in charge. Tough acts to follow, to be sure. I’m honoured to have been asked and have embarked on a rigorous training regimen that includes 30 minutes in front of the bathroom mirror every day speaking into my hairbrush. So far, it’s going well. I hope to be up to the challenge by June. Like so many other Canlit lovers, I’m torn up today. 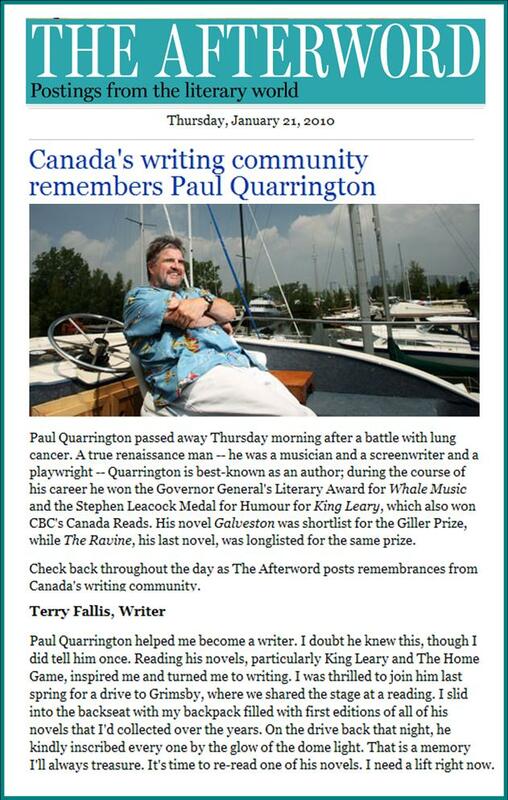 There will no new Paul Quarrington novel to anticipate. Not any longer. Every few years there would be another, and we would line up to buy it. Then we would line up to hear him read sections to us (so much better than reading it ourselves). Then we would lament that we’d finished reading it. Then, the interminable wait until his next offering arrived. The Quarrington cycle. I know it well. 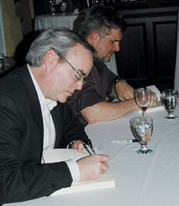 Long before I dared dream I might one day be a writer, I became an avid Quarrington fan. King Leary was my introduction. I was hooked. I quickly powered through the Quarrington canon and started collecting first editions (I do this for favourite authors). I loved his humour, melancholy introspection, and note-perfect dialogue. I can’t say I wouldn’t have written The Best Laid Plans without reading Paul Quarrington. 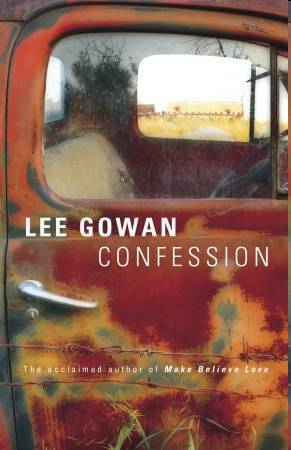 But I can say with certainty, that his writing inspired me and taught me that it was possible to write a comic novel with a message and with a heart. Sharing a car with Paul, and then the stage for a reading in Grimsby last spring, is a highlight in my fledgling writerly life. That, and appearing on the list of Leacock winners with him. I will miss him. You can bet that I’ll have my nose in a Quarrington novel before the night is out, in tribute. The post I wrote upon Paul’s diagnosis. The National Post’s online book site, The Afterword, collected tributes from the Canadian writing community today. Here’s my contribution. 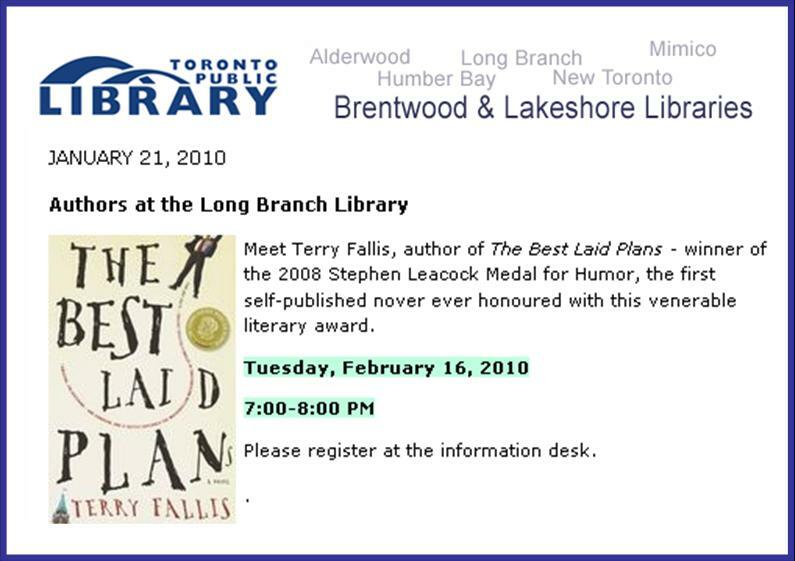 Last year, I did a reading at a public library in Toronto’s Beach community. When it was over, a young woman approached to have her book signed and to ask some writing-related questions. Our conversation carried on out onto the street after the event, and I got to know Evadne Macedo, aspiring novelist and all-round lovely person. Evadne is a lawyer, and works by day at the Ontario Human Rights Commission. But she’s also a writer. I read sections of an early draft of her first novel shortly after we met, and saw real promise in those pages. I loved the voice, matter-a-fact tone, and the quirky sense of humour. Well, in the intervening months, Evadne has been hard at work on her manuscript, while starting other writing projects as well, including a second novel, and a writing blog. I’m just now returning to her first novel manuscript, The 29th Day, now that she’s happier with it (or as happy as writers can ever truly be with the state of their manuscript!). 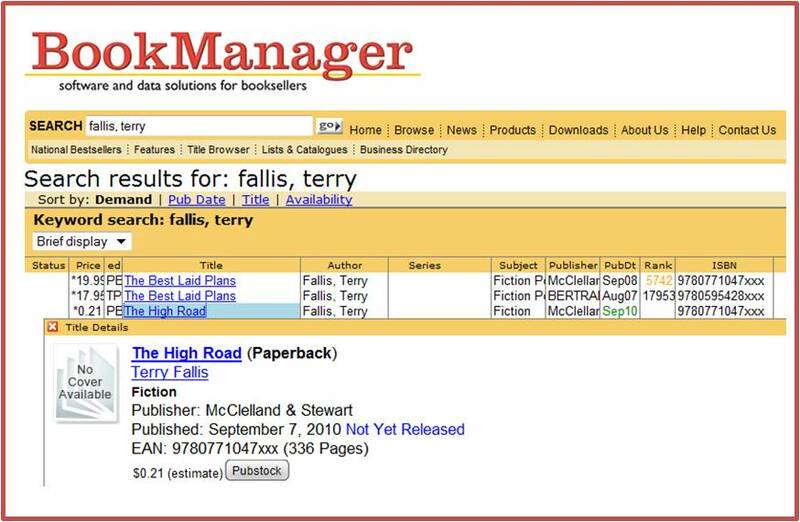 I’m looking forward to reading it and offering whatever help I can as she ventures into the publishing waters. 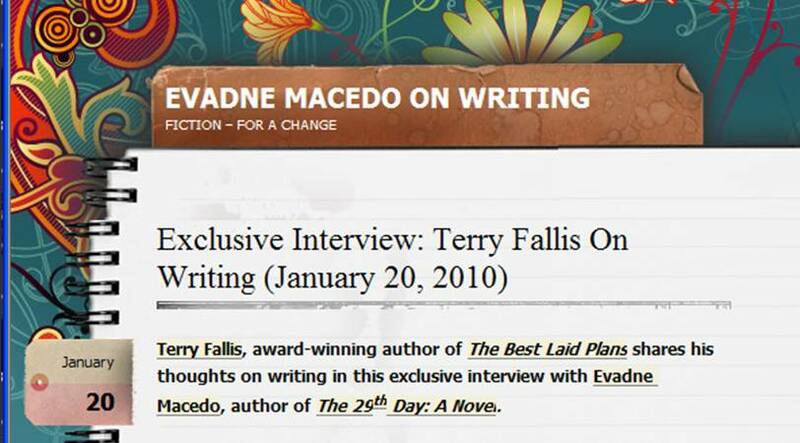 In the meantime, check out her writing blog where she’s posted some interesting interviews with other writers. Evadne is very good at asking thoughtful, meaty, questions. I fear I may be less accomplished at the answering part. My idea is to take what I’ve learned from promoting TBLP (such as it is), and share it with other writers who are looking for an audience. In my day job in public relations, I’ve really enjoyed the hundreds of hours ofÂ media training and presentation skills training sessions I’ve led for clients over the last 15 years. I hope this course will have a similar informal and interactive vibe to it. It’ll be only four sessions in November, so I’ve plenty of time to get my act together (famous last words). I have no idea what the heck happened in November and December to trigger such a big spike in podcast downloads but the graphic speaks for itself, and I’m thrilled. And judging by the pace of downloads in January, the peak may be even higher come the end of the month. Monthly downloads were chugging along at a stately pace for the first three quarters of 2009, when all of a sudden, something changed. Damned if I know what happened, but I’m glad it did. Remember that the final chapter in the TBLP podcast was uploaded back in May of 2007, nearly three years ago. Clearly, podcasting’s long tail is alive and thriving. New listeners are still finding the podcast every day. I was thinking of this today because later this week, I’ll be meeting with the digital folks at McClelland & Stewart to discuss a social media and podcast strategy for The High Road. I don’t yet know where we’ll end up, but I’m confident that I’ll be inflicting my voice on unsuspecting podcast listeners again soon. Stay tuned. This is quite unexpected. Okay, I’m shocked and thrilled at one and the same time. The Mark is a respected daily online forum for news, commentary and debate. 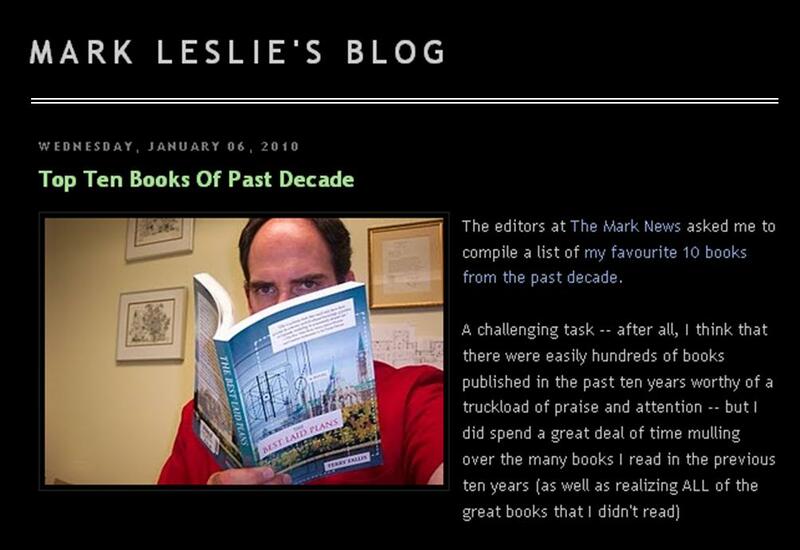 One of their regular arts/books contributors is Mark Leslie Lefevbre, a writer and bookseller in Hamilton, and he has compiled a list of his favourite books of the decade. Somehow, TBLP has made the cut. 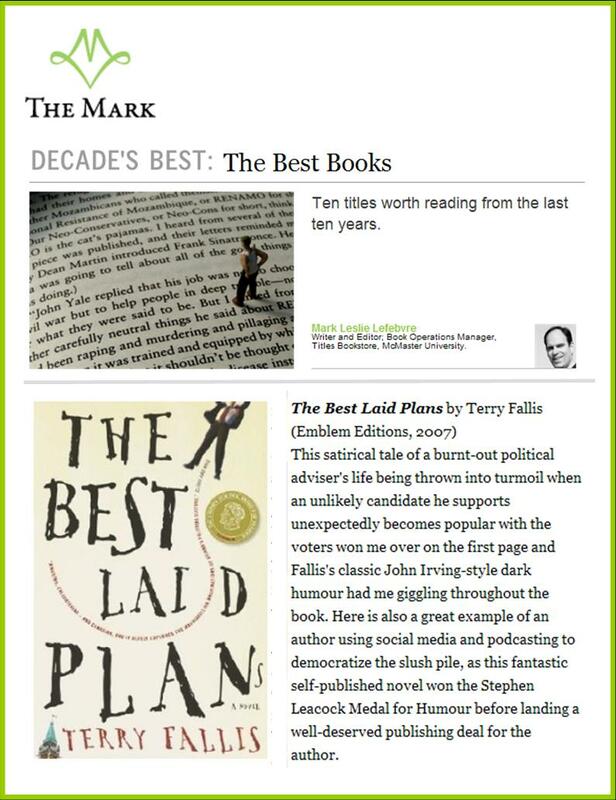 How wonderful is it to be among a list of ten books of the decade alongside J.K. Rowling, Malcolm Gladwell, Linwood Barclay, Stephen King, and Robert Sawyer? Wow. I’m bowled over. You can see the entire list here. Thank you Mark!